Nothing is more good-looking than a new shiny scratch-free stainless-steel sink with a polished chrome or brass faucet, a single handle lever or individual cold and hot water turning knobs. The best way to clean stainless-steel sinks is either using natural methods or with commercial cleaners. Sinks do become scratched simply from using them. When they do turn into a scratched up ugly state, we want to know how to remove scratches from stainless-steel sinks. To be honest, I’ve owned houses with stainless-steel kitchen sinks and no matter how hard I tried, I never removed all scratches. For knowing how to clean stainless-steel sinks, the most important cleaning method is do not use abrasive cleaning products such as Comet® or Ajax® powder cleansers that make even more scratches because they are so gritty. I do use Soft Scrub® with Bleach and it is not very abrasive. I clean my sinks thoroughly at least once a week. Soft Scrub® is good for porcelain and plastic-type bathtubs too. For the drain, just scrub inside and out with Soft Scrub® to be rid of coffee and other stains. I use a sponge to get the nooks and crannies inside the drain and it cleans up like new. Then I soak my double kitchen sinks with bleach water for about an hour to remove any more stains. 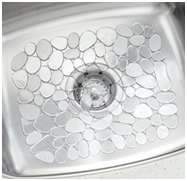 Another way to keep from scratching your stainless-steel or even porcelain sink is to buy yourself protective sink mats. I like this pebble look, but they can collect stains from tomato sauce, coffee, beets, and other staining foods. I simply pull the mat out when I’m dumping food down the disposal to keep from getting any stains on them. I put one in each of my double kitchen sinks. They really do keep the sink bottoms from scratching. Be sure to measure your double, triple, or single sinks. 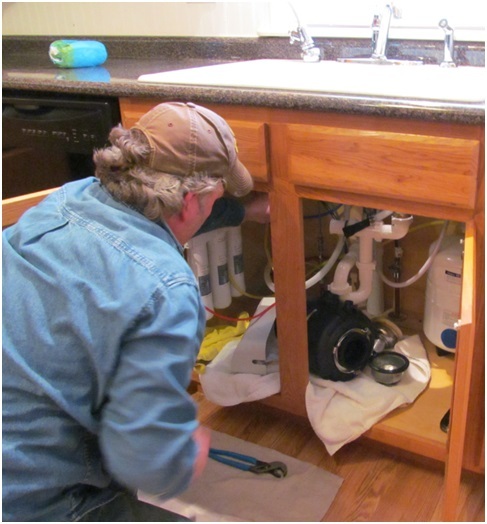 I do not cut out holes for drains; I move the mat when using the disposal side. These mats are available in colors but I prefer the clear pebble look. Do not use a scouring pad, harsh sponge, or steel wool because these can cause extreme harmful scratching to the stainless-steel. After rubbing the baking soda moisture in, rinse with cool water and wipe dry. You can clean your chrome or stainless-steel waffle makers with vinegar and lemon as well. Sinks—The best way to clean stainless-steel sinks naturally are discussed here. Limes and baking soda are a good natural choice, but limes cost about $1 each and you would need more than one! Rather than use expensive limes once a week, use baking soda and vinegar. It’s easy to learn how to clean sinks for a shiny finish. This mixture will also rid mineral deposits from hard water with a bit more elbow grease. Always clean following the grain of the stainless-steel; don’t scrub across it. Use about a half-cup of baking soda and clear distilled vinegar to make a paste. With a sponge or wash cloth (not paper towels) rub with the grain. Rinse and see how it looks. I like to fill the sink about 3-inches full of hot water and add about one-third cup of bleach and let it soak afterwards. Rinse and let it air dry. If you have rust spots, use the same baking soda and vinegar paste and let it sit overnight with a damp cloth on top to keep the moisture in. Then rinse and dry the next morning. 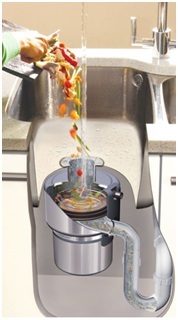 Garbage Disposal—I don’t go out and buy oranges, lemons, or limes to put down the disposal. 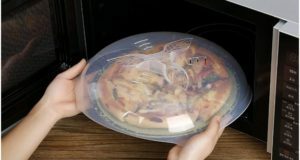 The thing to do is put those cut up peels and end pieces into the disposal a small amount at a time when you do have them, and save the scraps not used in the freezer until the time you want to use them this way. Never ever put coffee grounds down a garbage disposal. When you put grease down it, you will clog the pipes. 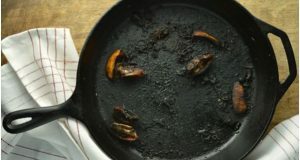 Always put grease into an empty can then into the trash. Bacon grease, for instance, can really clog it up. 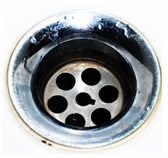 The problem with grease is that when it cools down, it solidifies inside your drain and creates clogs. For that reason, you should avoid putting oil and fats in your disposal unit or your drain only side, or down the toilet. Homes only have one drain pipe to the city sewer line. Put a few ice cubes in your disposal occasionally to knock off food residue that has built up on the unit’s blades. To make the blades even more effective, use ice cubes made out of lemon juice, vinegar, or some other biodegradable cleanser. These will freshen up the unit. Just be sure to label your ice trays so that you don’t accidently use them for ice intended to go into foods or drinks. 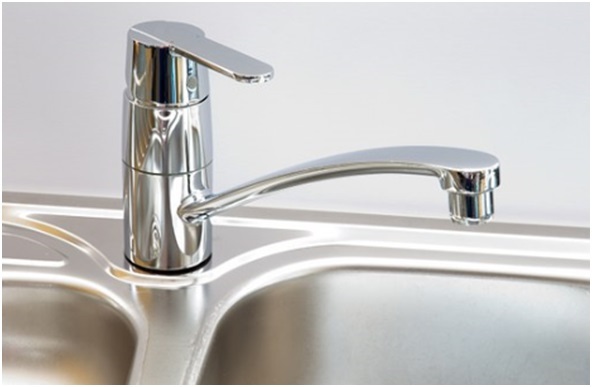 Faucets—Chrome or brass fixtures can be cleaned using pure vinegar or vinegar with water. If the faucet seal holding it to the sink is white, use a toothbrush to clean it with a little baking soda and vinegar paste and rinse well. Do the same around the sprayer attachment seal. My faucet is 6-years old and looks like the day it was installed. The reason is I dry it after I use the sink every time so it never has stains or water marks. I was so tired of mineral deposits in my toilet tank and bowl, around faucets, shower heads, and wherever water went that I put in a Whirlpool WHER25 3-Stage Under Sink Reverse Osmosis Drinking Water Filter System at the kitchen sink with its own water faucet. I love it for the best tasting water and it pays for itself not needing to buy bottled water. I also put a whole-house water softener in to get rid of city water minerals and lime scale. I did not have it installed in my refrigerator copper pipe line for water and ice maker dispensers. I had local people install a Whirlpool® brand and I love it. The oak cabinets look like my setup except I put the water tank in the rear right corner and the filters on the left side near the left door. Being single, I only change the filters every 4-years. Handy people can install this themselves, or unhandy people like me, call a professional certified licensed plumber. Below is my sink, my water purifier installed, and my super nice pro plumber now installing the disposal to the sink on the left side because the dishwasher drain must go down the garbage disposal side. I like the way he uses old rags to protect the cabinet floor and the hardwood floor. All hoses are out of the way and products can be stored.